Is this beautiful? 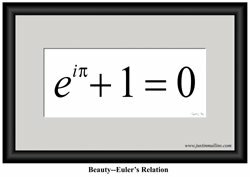 According to photographer, Justin Mullins this is supreme mathematical beauty: Euler's Relation. His website is proving immensely popular although only online for three months, and he is setting up an exhibition of his photos in London this month. Considering that maths is supposed to be a hopeless subject in today's society, it's rather encouraging to note that he is enjoying such success. In the same way that Eats, Shoots, and Leaves struck a chord with those who enjoy the written word, so these photos obviously hearten the souls of those who enjoy the austere beauty of mathematical equations. I have two favourites in the collection. 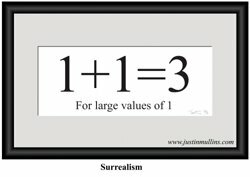 This one, entitled 'Surrealism' mainly as it's one of the only equations I understand, and for its humour. It also reminds of ghastly days when my dad would get irate at me for not remembering what 6+7 equalled. He was undoubtedly justified in getting irate, but it did nothing to help me remember the answer, and even paralysed my brain into working it out. Ahh, happy days... and ones which probably entrenched in my mind an unfortunate association: maths = anxiety. 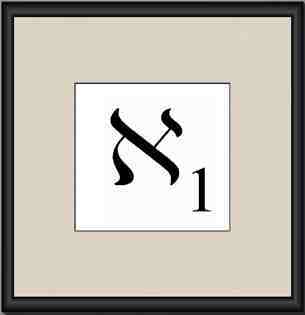 My other fave is Aleph one, which is the smallest number bigger than infinity. Quite apart from being a mind-boggling number, it is also rather an elegant piece of maths. For those of you who are champing at the bit to adorn your walls with these photos, Mr Mullins does have some for sale and I must say they would make rather stunningly original gifts for intellectual highbrows, graphic designers, mathematicians, higher mathematicians, pure mathematicians, philosophical mathematicians and anyone else with an interest in maths in art, design, photography and so on. Then, of course, there's people like me. That looks really interesting..I'll check the site tonight.